We open the Weekly Extreme Competition review with #426. My selection for the review is simply the consecutive weeks, from here to #435. I’ll provide complete tracing to the point of guaranteed collapse. I want to particularly welcome WEC players. I will do my best to enlist you into the sysudokie ranks, even as you continue making competition deadlines. My regular readers, please be patient when I sound like I’m talking to someone else, throwing in explanations and links to the familiar. When we’re done, and with added experience of the WEC review and WECer comments, we’ll all march on Fata Morgana. Let’s enjoy these Weekly Extremes in their fascinating detail. Wex 426 opened with a generous bypass and box marking. Then a routine line marking closes with a hidden pair. WECers, if you go through #426 again, but follow the traces, you can pick up the trace conventions without reading the traces page. 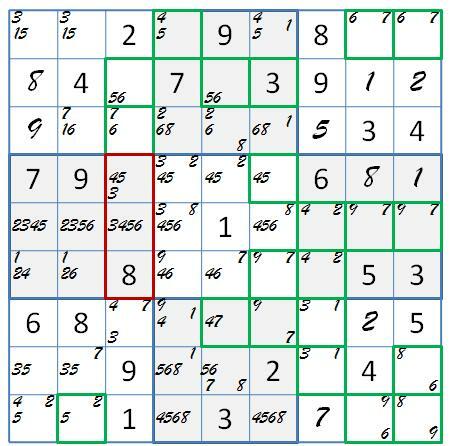 On the candidate grid the chute Wc3 can become a Sue de Coq 8(5+6)(3+4), (outlined in red) once we verify that the (5+6) alternative is not missing. The SdC, when verified, will remove 6r3c3, and 7r7c3. The verification is do ne with a trial trace, which reaches a contradiction, if there is one, in the lowest number of inference levels. The basic traces above are regular depth first traces. The trial trace is breath first. Compact traces are very helpful in analysis, and could greatly improve communication among experts. Are you on to my link conventions? It’s all there in the diagram: weak, strong, confirming links and grouping. If you look into what’s going on, that is. Follow up on the SdC removals was anemic, just NW7 => SW7 => S7m. WECers note, SdC’s are more plentiful than you might have thought. If you use the sysudokie definition, that is, including only one forced alternative and ALS removals. 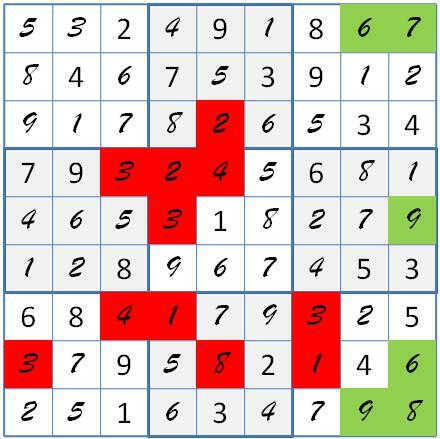 The 7r7c3 removal adds a bv (bi-value cell) to the bv map, and permits a regular 354-wing that would go victimless in the shared unit weak link vision of most Sudoku writers and many solvers, human and computer. But after fitting the 4-candidates with the grouped forcing chain sysudokie vision, two of them see all three members of the wing’s toxic set. Tell ‘em where you got it. 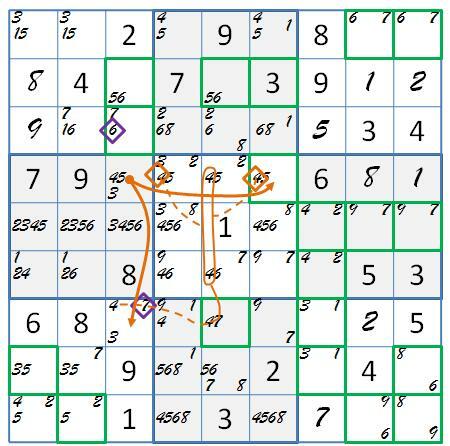 Continuing with the Sysudoku Order of Battle, I looked for XY-chains with the bv maps, then went on to the X-panel for X-chains and fish. In this case I was pulled along toward coloring by the luscious field of bv. I went to blue and green on the isolated 6789 cluster in the East boxes. A more integrated red/orange cluster traps a 6-candidate. not (blue and red) = green or orange. 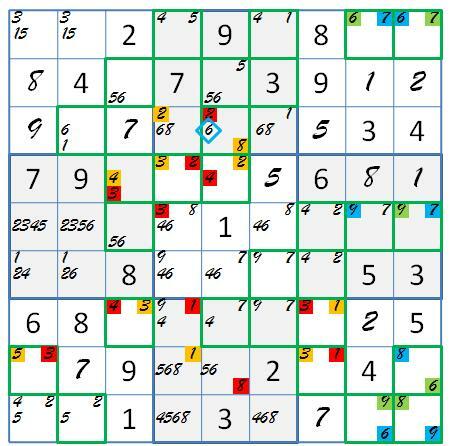 But a true green 6r8c9 would color a second 5r8c5 orange! That is to say: green =>red. OK, so that also is to say that: not red = orange => not green = blue. And more to the point, either (green and red) or (orange and blue) is true. It’s a merge into two opposing armies! WECers, does your platform do coloring this well? My ©PowerPoint screen templates are available via email. You don’t have to construct them yourself. See the toolware page. No charge. Not kidding. I picked orange and blue for a trial, and that forced two 6’s in r6, so its green and red. I’m particularly anxious for my WEC friends to know what I mean by a trial. It’s a test of a sizeable set of values, constructed logically to be all true or not all true. It is meant to go all the way to the solution, or to a profitable contradiction, proving an opposing set of candidates to be true. And it is meant to be a sysudokie alternative to the arbitrary election of a cell value for trial-and-error. 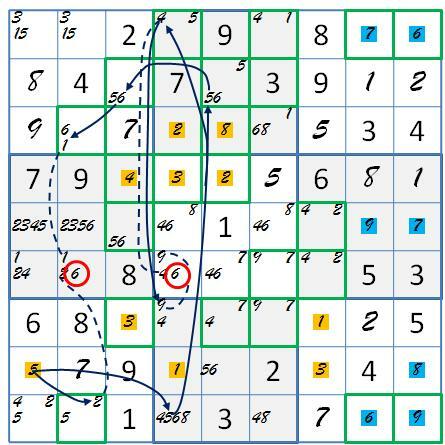 Sue de Coq verification, illustrated earlier in this post, is a trial, but in an early stage of solving, with generally less at stake. It puts a smaller, but far from arbitrary, combination of values on trial. I concede my early use of the advanced, “missing alternative testing version of Sue de Coq is a grey area in the T&E debate. Comment to this post and voice your opinion. If you are one of those whose path to the WEC solution is littered with arbitrary guesses, you are missing challenges that would suit your abilities better. Here is the 426 solution in merged green and red. I don’t consider the trial of an extended cluster to be particularly extreme. Maybe you’d like to look over what you did on 427 before my next post at 2 p.m. EDST next Tuesday. 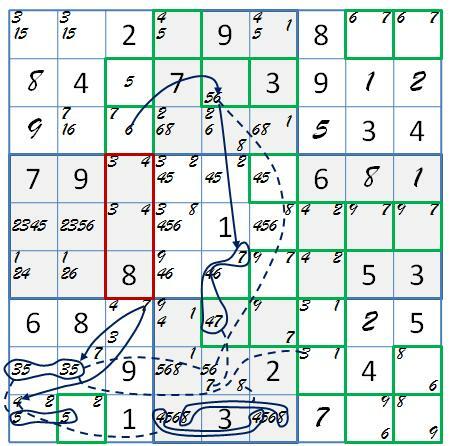 This entry was posted in Advanced Solving, Puzzle Reviews, Weekly Extreme and tagged Medusa coloring, merging clusters, Sudoku traces, Sudoku trials, Sue de Coq trial, Weekly Extreme. Bookmark the permalink.